I WOULD LIKE TO ADD MY VOICE TO THE MANY WHO HAVE WRITTEN IN SUPPORT OF APPLYING BP COASTAL IMPROVEMENT FUNDS TO REOPENING THE MOUTH OF THE SAN BERNARD RIVER. WHILE I KNOW THERE ARE MANY LAUDABLE PROJECTS BEING CONSIDERED, THERE NOT MANY THAT QUALIFY IN THE SAME WAY AS OUR RIVER. THE DISRUPTION OF THE FLOW OF THE RIVER IS CLEARLY A RESULT OF SEVERAL POORLY THOUGHT-OUT FEDERAL ACTIONS. PRINCIPALLY THE BRAZOS RIVER DIVERSION CHANNEL WHICH FUNNELS SILT INTO THE MOUTH OF OUR RIVER. AS A FORMER COMMISSIONER TO THE FEDERAL ENERGY REGULATORY COMMISSION UNDER PRESIDENTS REAGAN, BUSH AND CLINTON, I WAS TASKED WITH THE DAILY RESPONSIBILITY OF EVALUATING AND BALANCING THE ENVIRONMENTAL IMPACT OF PIPELINES, HYDROELECTRIC AND ELECTRIC TRANSMISSION PROJECTS ON DELICATE AND VALUABLE NATURAL RESOURCES LIKE THE SAN BERNARD RIVER. I CANNOT IMAGINE A MORE EGREGIOUS OUTCOME ON THE SENSITIVE ECOSYSTEMS, FISH, BIRDS, VEGETATION, AND THE LIKE. MOREOVER, THE NEGATIVE COMMERCIAL IMPLICATIONS ON FLOODING ISSUES, BARGE TRAFFIC, AND THE FISHING INDUSTRY THAT ONCE DOCKED AT THE RIVER'S END. IF MY COMMISSION HAD PROMULGATED AN ORDER THAT WOULD HAVE HAD HALF THE DETRIMENTAL EFFECT ON THIS VALUABLE RESOURCE. WE WOULD (AND SHOULD HAVE BEEN) OVERTURNED IN AN INSTANT BY THE DC CIRCUIT COURT OF APPEALS. THE GOOD NEWS WE HAVE AN OPPORTUNITY TO RIGHT A WRONG THAT HAS PERSISTED FOR A VERY LONG TIME. THIS TIME WE CAN FIX THE PROBLEM PERMANENTLY WITHOUT COSTING THE TAXPAYER ANYTHING. AS A USER OF THE RIVER FOR MANY YEARS AND A HOMEOWNER ON THE RIVER SINCE 2004, I HAVE SEEN A PERSISTENT DEGRADATION OF ITS WATER CONDITION. I ALSO SAW BRIEFLY WHAT A DIFFERENCE THE NATURAL FREE FLOW OF THE RIVER HAD ON ITS ABILITY TO COME BACK TO ITS ORIGINAL CONDITION. I URGE YOU TO SEIZE THIS OPPORTUNITY TO RETURN THIS HISTORIC LITTLE RIVER TO ITS NATURAL STATE. The mouth needs your voice! The proposed project is to open the mouth of the San Bernard River via dredging the current silted in channel to a width and depth that will enhance river flow. Here is your opportunity to voice your opinion regarding the Mouth of the San Bernard River Restoration Project. A 45 day public input period is now available. If you have not already read about the mouth project, click on this LINK, enlarge the map a few times by hitting the + sign and click on the diamond icon that says “Mouth of the San Bernard River Restoration Project” located just south of Freeport. You will see the project description there. Please comment on just reopening the mouth, not the other projects on the list for consideration to receive RESTORE funds. 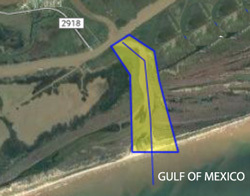 Restore the historical flow of the San Bernard River to the Gulf of Mexico by dredging the mouth of the San Bernard River that is currently silted in. Restoring the flow will benefit the threatened and endangered species habitat, essential fish habitat, as well as improve the overall environmental and economic health of the Texas coastal estuary system. Read TCEQ Commissioner Toby Baker's letter to Rep. Dennis Bonnen regarding the public comment period. Need help in writing - here's a sample letter. I understand reopening the mouth is just one of the many challenging issues facing the Texas Gulf Coast, however, one that can be solved. Looking forward to having a great river made even better. Deadline: Written comments should be submitted electronically no later than 5:00 pm central time on Fri Jun 30, 2017 (extended due to MIP revisions).